At the Bauhaus Center we frequently receive inquiries about Bauhaus Hotel recommendations here in Tel Aviv. Here is our top picks in Bauhaus Hotels in Tel Aviv with a short description as we see it. We are looking forward to welcome you in our Bauhaus Center Gallery & Shop on Dizengoff Street 77 and on our popular Bauhaus Tour during your stay in Tel Aviv! The Bauhaus Center is not affiliated with any of these hotels, but we receive a small compensation if you click on the links below for your booking. Thank you for supporting Bauhaus Center, we are proud to present you with up to date content and tours since 2000. The “Esther” Cinema was built in 1938-39 by architect Yehuda Magidovitch. The building was designed to harmonize with the plaza designed by Genia Averbouch that required uniform facades composed of concave balconies. In 1998-2000 the building has been renovated and changed into a special boutique hotel. The hotel lobby was placed in the cinema lobby. The monumental staircase is an impressive architectural space, constructed as wide spiral stairs. Cinema artifacts were placed on the floors with show boxes featuring the story of the cinema that operated there. Not in vain is the hotel now called “Hotel Cinema”. "A hymn to the Bauhaus style"
The Lily & Bloom Boutique Bauhaus Hotel is located a few steps from Rothshild Boulevard in the bustling center of Tel Aviv, a 15 min walk from the sea, and a 5 min walk from Shuk HaCarmel – your urban home in Tel Aviv. The original building was designed in the 1930s by architect Alexander Friedman and once was the the first branch of Mizrachi, one of the oldest banks in Tel Aviv. It is one of the municipality-protected Bauhaus structures and the heritage is preserved outside and inside with tasteful furniture and design objects recreating the look and feel of the 1930s. 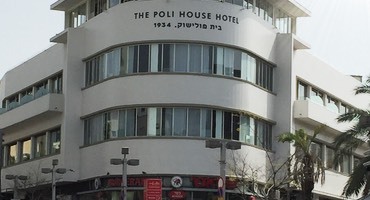 The building of Hotel “Center” was erected in 1948 by architect Haim Meshulam. It follows the same concave facades as all the other buildings around Dizengoff Circle, which was designed in 1934 by Genia Averbouch. The facades of the houses in the square, shaped by horizontal openings, give an impression of a complete circle. With the years Dizengoff Circle became the “heart” of the White City of Tel Aviv. It represents the modernist architecture and has become one of the cities icons. The Center Hotel hosts a wonderful roof garden, allowing its guests to enjoy the urban environment with an impressive view. The building of the Diaghilev Hotel was erected in 1934 by architects Joseph & Ze’ev Berlin. It was once the printing house for the (still existing) Israeli newspaper Haaretz. Mid 1990s a new wing was added to turn it into the Diaghilev Hotel. The Diaghilev also functions as an art gallery, displaying original Israeli art in suites and public rooms and halls. Every six months the curated exhibitions change, arranged by curators specializing in local art. The displayed objects can be purchased on site. 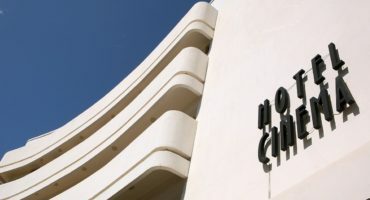 The Diaghilev Hotel is located in a quiet street just off the famous Rothshild Boulevard in the heart of the White City. The Norman Hotel’s 50 luxury rooms and suites are set across two magically restored buildings in the heart of Tel Aviv White City district. Individually designed guestrooms and residential suites span all the way to the 150 m2 (1614 sq ft) duplex penthouse suite which leaves no wishes unanswered – including a 60 m2 private sun balcony. The restaurants and bar in the Norman’s make it regularly to the top spots of Tel Aviv’s restaurant ratings. Enjoy the hotel’s spa and relax next to the rooftop infinity pool. Since its opening a few years ago, the Norman has set a new standard in terms of boutique luxury hospitality in Tel Aviv. The Rothschild 71 Hotel is one of the first Boutique Hotels which opened at the famous Rothschild Avenue. It is located in an original 3-story dwelling building planned by the important modernist architect Zeev Rechter in 1934. Today the Hotel hosts 25 luxury rooms and still guarantees for an authentic “Bauhaus” atmosphere. The Rothschild 71 is all about comfort, intimacy and class for both a business trip and an urban vacation alike. 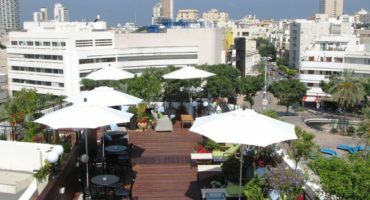 Conveniently situated in the center of Tel Aviv’s cultural and financial quarter, located on the famous Rothschild boulevard, the hotel and it’s surroundings melt the old and the new in a way like only Tel Aviv can. A boutique hotel with the feel of a private residence in central Tel Aviv, at the White Villa nomen est omen. The mansion was originally built by architect Samuel Barkai for the Silberstein family. Inspired and influenced by Le Corbusier, he designed this White Villa as an urban dwelling – a unique asset in hustling and bustling Tel Aviv city-scenery. The original house featured a grand foyer with the upper floor designated as a generous living-space for the 12-member family. The characteristics and identity of the family-mansion stays intact and inspires guests in todays boutique hotel. The location just in between Dizengoff Center and Rothschild Boulevard is perfect to experience Tel Aviv White City living.